A week in upstate Wisconsin for a birthday celebration gave me the opportunity to renew my acquaintance with what used to be the Soo Line, later Wisconsin Central, and is now part of CN. Ironic really that what was once a subsidiary of Canadian Pacific (the Soo Line) is now an integral part of CN. On Monday 2nd, which was the Labor Day public holiday, we also got to see regional carrier Wisconsin Southern around Slinger, WI. The sequence ends with a few of the Chicago L around The Loop and in Evanston. We broke the 350 mile drive from Naperville, IL to Sayner, WI at Stevens Point WI, home of the Stevens Point Brewery ( http://www.pointbeer.com/ ) and an important yard on the former WC. 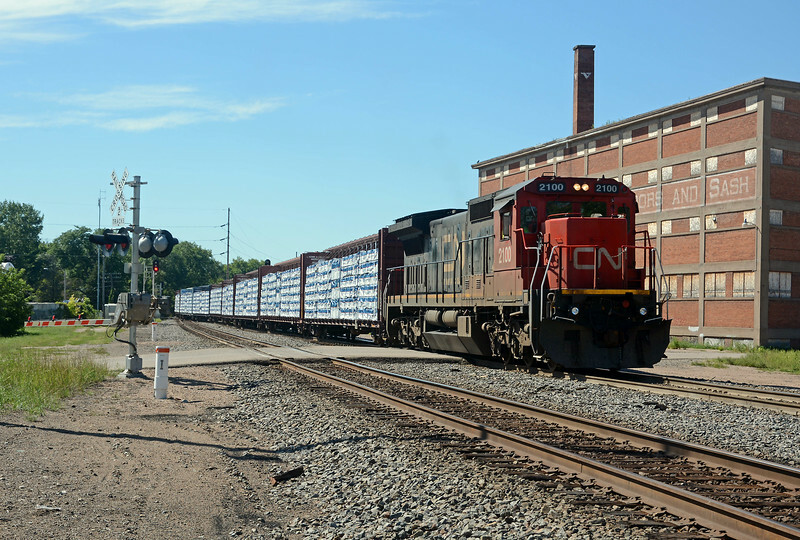 CN 2100, a GE C40-8 brings in a train of lumber and logs. Presumably a local which will terminate in Stevens Point Yard. The Vetter Door and Sash factory makes for a nice background, despite being semi derelict.